If you’re going on holiday soon, you might want to get into the best shape you can before changing into endless bikinis. A beauty slimming routine can be really helpful to quick start that process, and I think the Yves Rocher Minceur Intensive brand-new range is really worth checking out. Minceur is an intensive complete slimming range that combines gels and supplements designed to re-contour the body and attack unwanted curves. You can use them alone or combine them to get the maximum effect. The supplements contain Guarana seed extracts help with your metabolism, Green Tea leaf extracts to slow down the storage of fatty cells and slimming Yerba Mate extracts to help to slim your silhouette. I tried the Anti-cellulite action Dimpled Skin Smoother, a gel that targets cellulite – something we always needs a little help with! 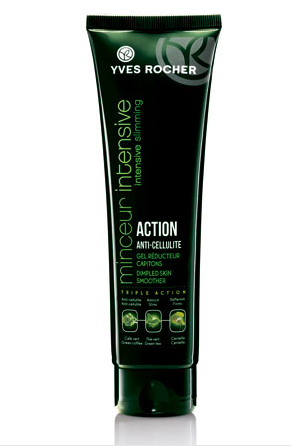 It contains Green Coffee, Green Tea and Centella to create a triple action botanical solution. The gel is light in texture and melts into your skin without feeling sticky and it has a light scent that reminded me of freshly cut grass. It’s very easy to apply and for best results it should be used morning and night. OK, so it’s not an overnight miracle cream, but in tests carried out on 25 women with a twice-daily application during 1 month, 87 % said they obtained anti- cellulite efficacy. So if you’re on a bikini-body mission, give it a go – you won’t regret it! The Defiligne Triple Action Slimming Food Supplement is priced at £28.50 (Box of 60 tablets). And the Anti-cellulite action Dimpled Skin Smoother Tube (150 ml) is priced at £27.00. For more information go to yves-rocher.co.uk. This entry was posted in Body, Ethical, Skincare, Wellbeing and tagged anti-cellulite, bikini bosy, bikini ready, cellulite, holiday beauty, Yves Rocher. Bookmark the permalink.